Bill has enjoyed the opportunity to engage involvement in a variety of community non-profit organizations. America in Bloom: America in Bloom has encouraged and helped over 150 communities from across the United States to improve the quality of life for residents and visitors since 2001. Kirkwood in BLOOM: Engaging Kirkwood's community pride to realize an enhanced community landscape by seeking, securing and utilizing human and financial resources effectively since 2004. Gateway Greening: Gateway Greening, since 1984, is a non profit 501c3 organization dedicated to creating active urban green spaces throughout St. Louis that are places of beauty and provide healthy food and opportunities for teaching and learning. Gateway Greening is a nationally recognized and respected organization valued for our expertise and collaborative approach to garden-based community development and public health. Civic Greening: Gateway Greening, is a founding participant in the Urban Roots downtown St. Louis landscape enhancement initiative. 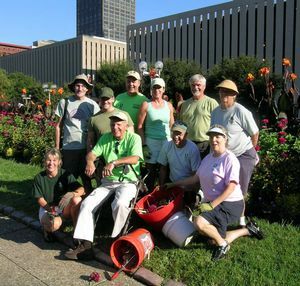 Since 2005, Gateway Greening and the volunteer efforts of a team of organizations has inspired and managed the seasonal color gardens at the Market Street and Tucker Blvd landscape medians and Kiener Plaza in downtown St. Louis. Kirkwood Urban Forestry Commission: Serving to promote high standard of long-term planning, maintenance, and perpetuation of Kirkwood's publicly owned trees and encouraging responsible management and maintenance of privately owned trees since 1998.